After two dominating performances in the first and second rounds, Duke has countered the doubters and proven its merit as one of the favorites to cut down the nets in Indianapolis. Before we face off with Purdue on Friday, Jake, Chong and guest-author Arun reflect on three things the team has done to get this far—and that will help push us to our eleventh Final Four appearance. Much has been made this season about the emergence of Duke’s big men as a key difference with this year’s Blue Devil squad. Yes, Brian Zoubek has finally developed an offensive game that can complement his rebounding skill. Yes, Lance Thomas actually isn’t triple-pumping every (missed) lay-up. Through all of this, though, what really strikes me as the difference in our inside game is the improvement in interior passing. Though this doesn’t apply to the Plumlee brothers, it’s no secret that Duke’s starting big men aren’t the most athletic players in the country. Thus, it’s unreasonable to expect to just feed Lance in the paint and expect him to put the dream shake on Jajuan Johnson or Demarcus Cousins (too bad we don’t have Travis Leslie, right?). Over the past month and a half, we’ve begun to see more pick and rolls, oftentimes culminating in a Zoubek layup off a Scheyer assist. We’ve also noticed better passing coming from all our big men, but particularly from Lance. If Duke wants to make a serious run for the championship, this crew is going to have to continue making crisp passes within 15 feet of the basket. This way, we not only use our size to score, we also use it to physically wear down the opponent. The efficiency of our interior passing, my friends, is why we’ve been able to utilize our big men in such a productive fashion, all while relying less and less on the three-point shot. Jon and Zoubs team up for the blocked shot. Photo courtesy of DukeBluePlanet.com. The numbers speak for themselves. Duke has allowed a combined 97 points in the first two rounds: 44 to Arkansas Pine-Bluff and 53 to California. OK, so maybe the Pine-Bluff game isn’t that big of a feat (although no disrespect to the SWAC). But the Berkeley Boys were a dynamic offensive team before meeting Duke in the second round—it was the first time the Golden Bears had failed to score 60 points all season. Like Duke, Cal boasted a ‘terrific trio’ of guards—Theo Robertson, Patrick Christopher, and Cal’s all-time leading scorer, Jerome Randle. But they were stymied. Christopher, who missed the first several minutes with a cut, never got into the flow of the game, mustering just 2 points. Randle got free in the first half for several layups (thanks to some illegal picks from the linebacker-esque Markhuri Sanders-Frison). After seeing him hit a 30-footer at the halftime buzzer of Cal’s win over Louisville, many Duke fans worried that Randle would go off Eric Maynor style in the second round. But as ESPN regional blogger Brad Bennett wrote, Nolan Smith got angry and locked Randle down. (Ironically, former Dukie Jamal Boykin was Cal’s best offensive player Sunday—can we take a little credit for that? OK maybe not). Duke Chronicle columnist Alex Fanaroff compared our defensive performance to a boa constrictor, slowly leaking the life out Cal with a dominant rebounding performance. That’s an apt metaphor, and one that must continue to apply. We have three great scorers on this team, but our 9 man rotation will provide the extra defensive oomph all the way to Indy. Arun – Free of the Three? The "Four Pillars'" presence in the paint has had a huge impact on Duke's offensive and defensive effectiveness. Photo courtesy of DukeBluePlanet.com. Live by the three, die by the three. 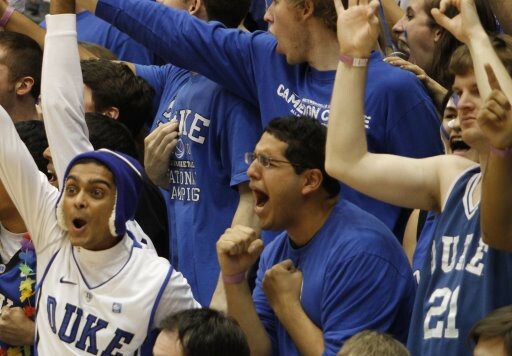 Since the days of Redick, it’s been the trademark phrase for Duke lovers and haters alike. And for good reason. In the past, when Duke’s guards didn’t make it rain from the beyond the arc, the Devils’ demise was soon to follow. All too often, a drought from the three point line spelled defeat for the Devils in the most crucial of games. (See: Villanova, 2009). The story has been different this year, especially for those games on the biggest stages. (See: California, last week). Still, having success without making the long ball doesn’t mean Duke hasn’t been attempting it. Last week against Cal, Duke shot an abysmal 3-17 from three (1-8 and 1-6 from Scheyer and Singler respectively) and yet still managed to cruise to a comfortable, double digit win. The quantity of shots hasn’t changed. Neither has the quality, even though it seems like wide open shots haven’t gone in as of late. So what’s different? The answer doesn’t lie with shot selection, but instead with Duke’s personnel. It’s no secret that Duke’s four major frontcourt pillars have given us an edge this year in an area where we haven’t recently had it: offensive rebounding. With leapers like the Plumlee bros, a lanky workhorse in Lance Thomas, and a space eating monster in Zoubek, this year’s team excels in cleaning up the mess after missed three point shots. Miles and Brian in particular have improved their board-grabbing abilities from last season, and Zoubs has emerged as arguably the best offensive rebounder in the nation. More offensive boards have led to more second chance opportunities and easy points (oh, and some nasty tip-dunks too). Duke’s not free of the three just yet—the long range jumper is still an integral part of our offense. But this year, having excellent rebounders down low can give our shooters some peace of mind. Peace of mind translates into shooting confidence. And confidence translates into buckets. OK, so we’re feeling pretty good here on the blog. Back us up, Duke! See you tomorrow with a preview of the regional weekend. First up? Purdue.